DAVOS – A total of 76 World Trade Organization (WTO) members have agreed to start negotiating a set of open and predictable regulations governing the growth of e-commerce. The members included the United States, the European Union and Japan, among others. Reuters reported that on the sidelines of the World Economic Forum in Davos, negotiators from the 76 countries and regions agreed on Friday January 25 to hammer out an agenda for negotiations they hope to kick off this year on setting new e-commerce rules. “…there are no solid rules on e-commerce,” Japan’s Trade minister Hiroshige Seko told reporters in Davos. China signalled conditional support for the initiative but said it should also take into account the needs of developing countries. The country’s WTO ambassador Zhang Xiangchen said the e-commerce declaration “could have been better drafted” but Beijing was still willing to co-sponsor it and would play an active role in the exploratory talks. But Beijing’s call for “full respect [to be] accorded to the reasonable requests of developing members” could increase friction with Washington, which says the WTO must stop giving special treatment to countries such as China that call themselves “developing”. Another Asian giant, India, did not join the initiative. It had said the WTO should finish off the stalled talks in a previous round before moving into new areas. 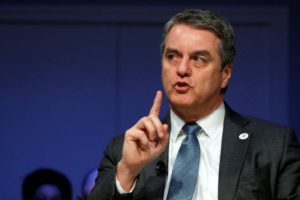 Last year, the WTO’s 164 members failed to consolidate some 25 separate e-commerce proposals at a conference at Buenos Aires in December, including a call to set up a central e-commerce negotiating forum.